Restaurant burn injury claims in California are something I have seen far too often as a CA personal injury attorney. These incidents can happen in fast food chains like McDonalds and Starbucks, large chain restaurants like Applebees, Chilis, TGI Fridays or the Olive Garden, or in local diners and smaller establishments. Busy food service venues in large urban areas like Los Angeles, Orange County and the Inland Empire tend to have a higher volume of patrons and employees interacting and larger food service area, which can lead to a higher percentage of mishaps. Sometimes, these incidents are merely accidental or the fault of the customer. However, there are many instances where the cause of being burned in a restaurant environment is the direct result of negligence on the part of the owner, operator or employees. Servers spilling hot food or liquid on patrons: Unfortunately, one of the more common mishaps causing scalding injuries in the food service industry are waiters and waitresses spilling hot food or beverages. It only takes a split second of miscalculation for a server to drop a hot liquid like coffee, tea, hot chocolate, soup, or an extremely hot food item into the lap or on the body of a diner to cause severe bodily harm. Dangerous Furniture or Premises Conditions: Many times, there are tripping hazards such as snags in carpeting or defects in hard flooring located in the dining or cooking areas of a restaurant that can cause a cook or food server to trip, fall and drop hot items on customers. Defective table set up is also a common cause including tables that are not level and cause tipping of hot items into the laps of consumers, and cloth coverings that can be pulled by small children or catch fire. Flaming Food or Beverages: Some food items and drinks are intentionally set aflame. This includes certain types of flambe or sizzling grill foods that are brought to the table either flaming or on a very hot platter and also certain types of alcoholic drinks that are set aflame via high alcohol content hard liquor such as “151”. When mishandled, these food and beverage items can cause burns and scalding. 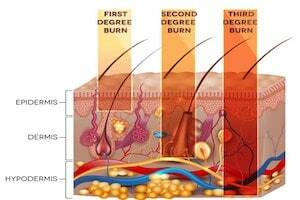 Scalding of the skin can lead to serious injury and medical complications. Liquids with a temperature of 140 degrees fahrenheit can take 5 seconds or less of exposure to human skin to cause scalds. Given that most hot coffee, teas and other hot beverages are heated to between 160 and 180 degrees, a burn can result in just a few seconds. While a burn is a significant injury to a person of any age, children and older adults tend to be particularly vulnerable. This is because a burn can cover a higher percentage of a child’s overall skin area and because senior adults tend to have thinner skin. Facial burns including burns to the eyes can also cause major complications including partial or full blindness. Scarring is very common following this type of incident and can require major reconstructive surgery such as skin grafts. Burns are serious and require immediate first aid and medical attention. Other than covering the area with a dry, sterile cloth or gauze, treatment of a significant scald should be left to medical professionals like Emergency Medical Technicians, doctors and nurses. If there is any indication that the injury was caused by the negligence of an owner or employee of an eatery, bar, coffee shop or other food or beverage business, consulting with a California lawyer familiar with investigating these types of claims and establishing legal liability for payment of medical expenses, lost wages, future care and treatment including surgeries and compensation for physical pain, emotional distress and disfigurement can make all the difference between shouldering the financial burden of the event or forcing those legally responsible to pay their fair share. For a free consultation regarding any restaurant burn injury claim in California including Los Angeles, Orange County, San Diego or the Inland Empire, call our injury helpline at 866-966-5240.